Book Synopsis: Seasoned clinician and mother of a daughter with ADHD, Debra Burdick draws on nearly 27 years of clinical and personal experience to offer a comprehensive description of the major treatment options available today, some of which may be new to many readers. 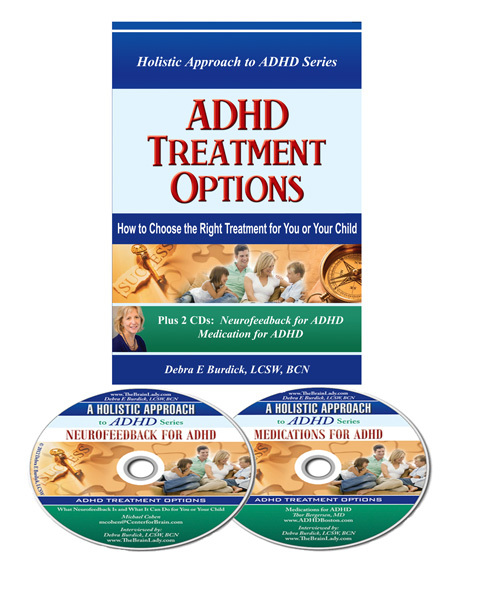 This book and CD set provides a step-by-step review of the strengths and limitations of ten treatment approaches for children and adults with ADHD. What can you expect from counseling? How does coaching work? Why and where to find a support group? What should you expect from the school? Why did the American Academy of Pediatrics place Neurofeedback on its ‘best support’ list for ADHD treatment? What are the pro’s and con’s of medication? How does Naturopathic medicine approach ADHD treatment? Does acupuncture help ADHD? What does the research say about using mindfulness for ADHD and what is it? What nutritional supplements should you look into? The first CD contains a discussion about using Neurofeedback to treat ADHD and the other a discussion about using medications. This easy to use book and two CDs teaches adults and parents what they need to know in order to choose the best treatment options for themselves or their child.